10th Floor near Elevator - King Bed, 2 Double Beds --Spectacular Oceanfront View, Beautiful, Recently Remodeled Condo, Sorry NOT Pet Friendly -- FREE Beach Service! Please note: Beach Service is Free with this condo! You will love the beautiful decor and magnificent Gulf view of Majestic Sun 1012B This condo boasts a breathtaking 'penthouse-type' view of the sugar white sand and emerald-green Gulf water from the 10th floor location. With this Gulf scenery, why go anywhere else? A quick elevator ride takes you to the top of Majestic Sun, where you will find peace and quiet at this fine condo. Beautiful furnishings, along with fully stocked kitchen, with all the pots and pans,silverware, glassware and equipment you will need to prepare your favorite meal. On your way to the pool, take a moment to meander through the amazing beach shop. Majestic Sun 1012B is only a very short stroll to the Whales' Tail beachside restaurant, where you can enjoy a great breakfast, a tasty lunch, or drinks and dinner seated on the deck overlooking the sparkling blue water of the Gulf. Visit the Silver Sands Premium Outlet center where you can get great deals on just about every type of clothing, shoes, jewelry and housewares. The Commons Mall, with stores like Belk, Chicos, and other fine stores, is outdoors and provides a fountain-like water pad where your little ones can play. Drive west to discover Big Kahuna water park for a fun family day away from the beach. 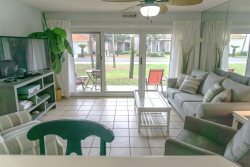 Book your vacation at this gorgeous condo on Scenic Gulf Drive today! Call or book online to reserve your dates! From the James family who stayed in Majestic Sun 1012B April 2019: I love being able to watch the dolphins from our balcony! This unit was everything I had hoped for. Everything was exceptionally clean and fresh, the ocean view and easy beach access were great! Also, the location was so convenient to everything without having to deal with heavy traffic. An easy walk down the beach to lunch and drinks at the Whales Tail without even putting your sandals on, let alone get in your car. My wife and I had a very relaxing holiday weekend which was just what we needed!